Bath time in our house is a social event. Since becoming the parents of a demanding toddler (armed with a growing vocabulary), my husband and I can hardly remember the days when taking a shower added up to a) showering alone, and b) getting in, washing up, and getting out. In our childhood, my husband and I both remember bathing and showering with our siblings and mothers, probably out of convenience and because bathing together equaled more playtime (does anyone else remember playing with tub town toys?). However, once we reached a certain age, our parents designated separate bathing times for each person; co-bathing became something special that only small children could do, and bath playtime was all but lost. Fast forward a few decades to the present. Nowadays, showering is a two-person activity and sometimes a group event. 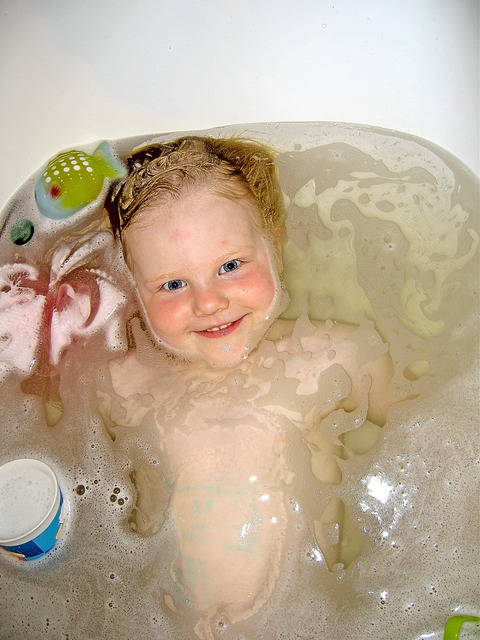 When Annabelle was a newborn and even a baby under age one, we bathed her in our tub or placed her in a toddler tub. This worked swimmingly so far as getting her clean was concerned; however, she howled with disapproval whenever mom or dad tried to sneak off to the tub by their lonesomes. Eventually, being the swift thinkers that her parents are, we realized that our little one might be more content if we simply invited her to bathe with us. And well, she is. On a typical day, Annabelle likely showers twice in the morning, once with my husband and another time with me; and if it’s been a particularly messy day or we’ve been at the public swimming pool, she showers yet again. Most of the time, she sits down in the tub and plays with her toys while one of us focuses on the business of washing up. My husband tends to shower first, so he takes care of soaping Annabelle and getting her clean. By the time I make my way to the shower, Annabelle is eager to join me for a second round of tub fun (though this time I shower and simply let her play with toys, collect dripping water with a cup, and splish and splash). Bathing together serves many purposes for our family. As most folks in the western world do, we bathe for cleanliness. But now that our toddler insists (and I’d say rightly so) on bathing with her mom and dad (and sometimes both at the same time), taking a shower or running a bath invites play, allows us to bond, and offers the opportunity to relax and heal after difficult days. Additionally, cobathing allows breastfeeding mothers, like myself, to nurture their babies, soothe engorged breasts, and to enhance milk production. A La Leche League article recommends that parents of adopted babies nurture their breastfeeding relationship by bathing together. Another La Leche League article suggests that breastfeeding mothers of newborns who have had a difficult time establishing nursing try cobathing as a natural way to soothe mom and baby, connect with each other, and relax into the breastfeeding relationship. For our family, cobathing is more often than not, a positive way to spend time together, to play, and stay clean and healthy. To establish a safe and fun bath in your family, you may want to check out Dr. Sears’ Bathing with Baby tips. What are your thoughts about cobathing? Does your family enjoy showering together or is bath time a sacred ritual for spending some time on your own? I used to bathe my baby in her own tub until she could sit up on her own. I was just too nervous about holding a slippery, soapy baby while I was also slippery and soapy. Although I did full up the tub and relax with her on occasion… she loved nursing like that and sometimes even fell asleep. But now that she can sit up, we share most of our baths. It’s play time and a great way to kill time when the day is long and the weather is sucky. Also I don’t have to have a rush-bath when she’s sleeping. I can take my time. I have enjoyed cobathing with my ds and dd. But now that ds is 10 month old and quite mobile, it has gotten a little crowded in the tub with three of us. So now ds and dd (3 years old) bathe and I supervise. They enjoy the time together. I remember bathing together with my sister (2-1/2 years younger). I don’t remember when we stopped, but I remember still doing it at least as a kindergartner. We always had a blast! As mentioned in the post, some of my favorite memories with my little sister happened while playing in the bath tub. I can only hope my own children consider tub time as much fun. One concern parents seem to have about cobathing though was in regard to what age cobathing becomes inappropriate. Since my dd is 20 months, we’re definitely not at that point. I’d love to hear what others think so far as when kiddos need to start bathing by themselves. Littlepixie is 21 months and she loves cobathing. All the fun of a bath but with milkies too! Previous post: World Breastfeeding Week Wrap-up & a Winner!